Sarah Reinertsen is a case study of the design and development of a website for an influential paralympic athlete who wanted an updated website built to highlight her athletic achievements and to provide a way for the public to contact her for public speaking engagements and events. The site for Sarah Reinertsen was designed to perform quickly and efficiently across all size screens even though it has large images and a home page slider with photos that extend the entire width of the page. The site was also given a responsive menu and contact form to work easily on large screen or mobile device. Highlights of Sarah’s journey to Kona, illustrated through embedded videos from her newly created IronSarah YouTube channel consisting of a three part webisode series. Also, highlighting her Instagram account and fundraising campaign for the Challenged Athletes Foundation with live time update of currently raised amount. We created a custom contact form to make it easy for her, and Sarah’s management, to quickly distinguish which kind of request was being made. The form uses the latest recaptcha from Google, which is mobile friendly, to prevent spam submittals. Sarah, an accomplished athlete, has many great photos from photo shoots. We wanted to highlight them so a home page slideshow of full screen photos was created to display many of them. 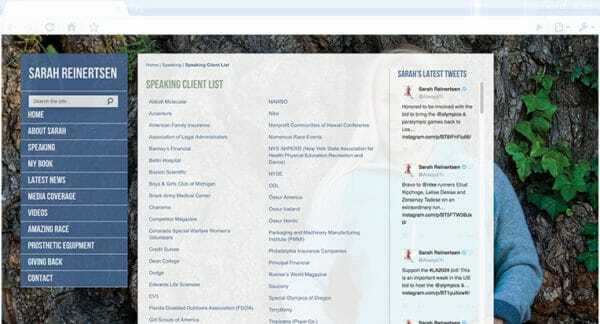 Sarah has done many speaking engagements so one page of the site is set aside to highlight her client list. The same page also contains her up to the minute tweets on Twitter, as she loves to engage with competitors and fans. Stacey recently designed my website, AlwaysTri.com and she did an excellent job! She helped me build a website that works for my business today and that I can build upon for the future. I have worked with several other web designers before and Stacey is far and away the best I’ve ever worked with. She is a talented designer, and has a depth of skills and knowledge in website optimization that was critical. I was also grateful for her thoroughness and attention to detail – which is important since websites are viewed on so many devices today there is a lot to consider in building a modern website. I would highly recommend working with Sunlit Studios on your next website project.